Please come and join us at our upcoming fundraiser "Perogies for Puppies" in Victoria! 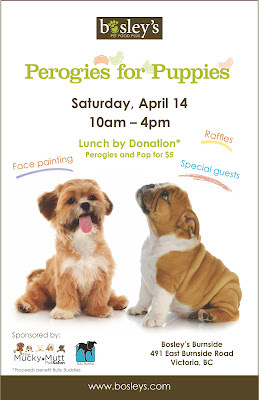 Lunch (perogies & pop) by donation, face painting, raffles, special guests & lovely adoptable dogs! Koa's wonderful adoptive family sent us a lovely update this week. Could Koa be any cuter!?! "I adopted Koa almost 2 years ago. I was browsing the website today when I noticed that Koa's Dad, Abe, passed away. I wanted to give you an update on how well Koa is doing. I couldn't have possibly found a better dog than my Koa. She is always by my side, she's the greatest at cuddling on cold winter nights and has the funniest personality I have ever seen in a dog. We share a warehouse/shop with Greg Fortier, who adopted Jenna and had fostered Koa. When we're working away and not paying attention to her, she'll often go play with Jenna, sleep under the heater, or chase her tail to get our attention. She's made best friends with my parents 2 yellow labs and loves going for visits. She loves going for walks in the snow and had her first camping trip last summer. She loves sleeping in the tent and exploring the woods. We live a 10 minute walk from the beach and although she can't swim to save her life, she plays in the sand and the shallow water. Koa has learned a lot since we got her, and calmed down a lot too. She still has her vices, garbage being her favourite (she's not allowed off leash on garbage days any more). I want to thank Bully Buddies for rescuing Koa. She's a happy, healthy, goofy dog and definitely a success story." Please meet Sweet Penny and Itty Bitty Boo who both just arrived in rescue. They both were found as strays and unfortunately nobody claimed them. It is hard to believe because both of these girls are truly special and extremely sweet! Penny is a big girl with a big heart - What a sweetheart! She is currently recovering from a broken pelvis. We will get her to the vet soon to make sure everything is healing well. Itty Bitty Boo.... How could we say no to helping this tiny girl!?! 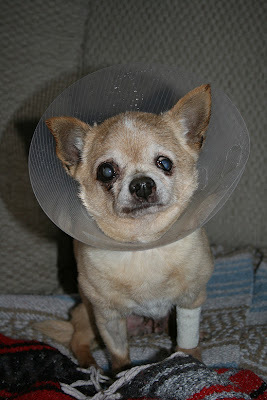 She is 15 years old, is blind in one eye and just underwent intense surgery yesterday to fix an inguinal hernia & dental. 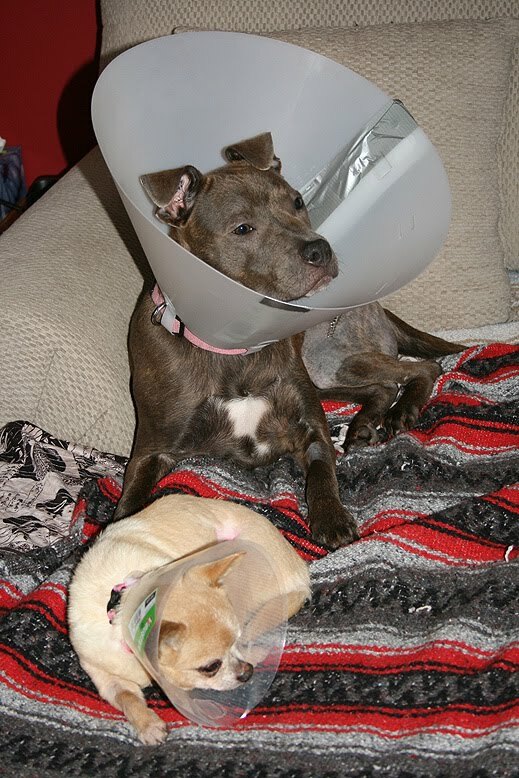 Luna - Update from her foster home. Luna recently went in for her heart, liver and kidney ultrasound- And has great and not so great news! Her heart murmur is caused by a little thickening so she should endure anesthesia just fine and safely! Yay Luna!!! However, her left knee has a torn cruciate and her right has a femur and cruciate issue.... We aren't sure about her hips. Even though she is scared, sore and worried at the vet, she handles it with a grace and style that we've yet to see in a timid dog! She stayed still for her ultrasound and didn't need any local at all, she allowed the vet to highly mess with her legs and knees for about 10 minutes in visible pain... Hard to watch for sure, but she just laid there knowing he had good intentions. It's all that love in her heart making it so strong!! She'll be going for full rear xrays and a spay soon! On a another note - She played!!! Really played for about 20 minutes with the foster family's Mastiff Malakai. It's only taken 2 1/2 months for a real good wrestle play, but she wrestled, groaned, moaned and bowled him over like the best of them!! She has love, snuggles and joy in her!!! Taz is an absolutely charming little 8-year-old Staffie who recently found his forever home in Portland, OR! Taz Earle is the sweetest most wonderful boy ever born!!!! Was an angel on the drive. Seems to love the backyard. Has marked every corner of it! We've played some good fetch & as you can see he's taken to the bed. I put Fin's blanket on the bed so he'd feel at home. He's an absolute love muffin in a Sherman tank body. Please welcome Bella Luna (used to be Sandy) to the Bully Buddies family! Bella Luna is an Olde English Bulldogge. She is currently in a compassion care foster home with 2 torn cruciate ligaments, blood infections and a heart issue. Luna came from a backyard breeder to LAPS with a few of her house mates. LAPS staff loved her so much and were so worried about her health, they called BB - We took one look at her adorable face, unadoptability and terrible story and found a foster home for her. She has since lived with an amazing short term foster while she weathered the end of her heat with 2 very rambunctious parrots, a foster mom and dad and 2 teenage boys - who spoiled her rotten and loved her right up! Thank you Lainie, Mike, Kieran and Brendan! You taught her love, and helped her through her fear of ..... well ....everything! She is currently living with Jenn and Al, a long term foster family of Bully Buddies. In her new home she has a bully and a mastiff for her buddies, 2 evil cats, Jammy the super rat and her new bff - a 5 year old human girl! Since Bully Buddies has taken her in, she has blossomed! Her health has gone from a short term outlook to open possibilities. Her pain is well managed with Meloxicam, her heart will be checked soon by a specialist, and we are watching her blood lymphocite levels. Our hope is that surgery for her legs and a spay will be a possibility. To meet this lovely lady you would never know that just 3 short months ago she couldn't walk and was afraid of her own shadow - Now she climbs up mountains, licks you to death, actually plays with her dog brothers now and is a true breed ambassador! Keep an eye out for this beauties ongoing story and her fundraisers to come.... she is fighting so hard for herself, it's only right we do for her too! Please consider making a donation towards her vet bills! 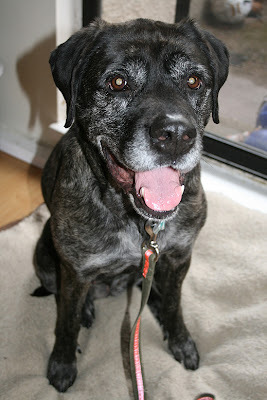 We are currently looking for a foster home who can give this handsome, big boy some much needed TLC. He was recently found as a stray. His collar had been deliberately opened so it was no surprise when nobody came forward to claim him. 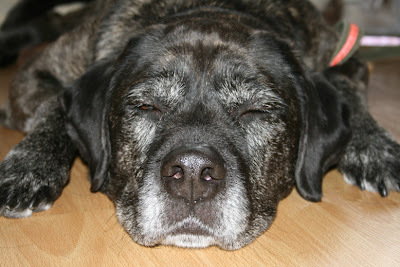 He might be a big hunk, but he is a very sensitive soul who finds shelter life very overwhelming. He would much rather wait for a forever home while in a loving foster home. He was most likely a backyard dog, he has no leash manners and needs training. He is incredibly sweet and gentle with people though and he is non-reactive to other dogs. 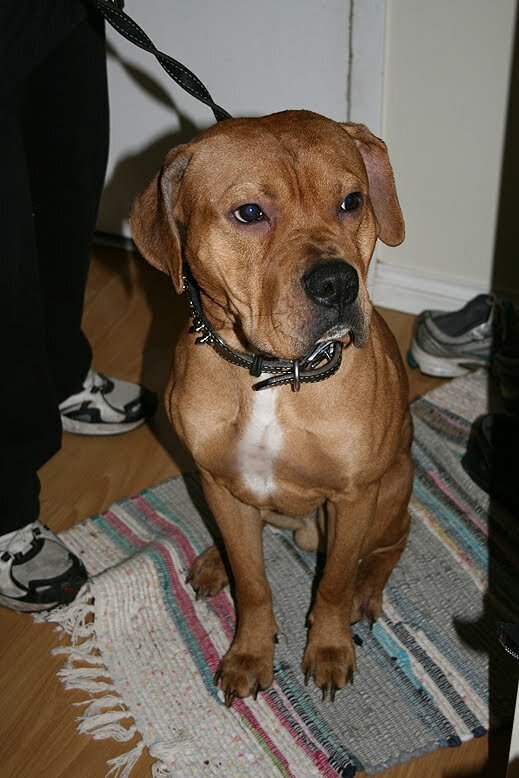 Please email us at bullybuddies@gmail.com if you're interested in fostering this handsome guy! Did you know that Bully Buddies’ New Year’s Resolution was to find more foster homes? Unfortunately there are often more dogs needing help, than there are foster homes available. Without loving, dedicated foster homes, dogs often don’t get a second chance. Please consider opening your home and heart to a dog in need! Update March 10, 2012 - Foster to adopt found!!! Angel came to Bully Buddies a few months ago because she wasn't doing well at the shelter. After a few months in foster care, this lucky girl found a forever home a few weeks ago! "Every day they get closer! Here is a pic of them tonight. First night Angel loved licking Cleo's ears - She tolerated it without much objection. Angel is learning she can't play with a cat like a dog and is very respectful of Cleo. Angel is adapting very well - she sure is a snuggle bug!" Aren't Angel and Cloe just adorable!? !